The new version of the 1000M GMT watch from the company UTS. The company UTS introduces new watches 1000M GMT, the new version of the line 1000M GMT. The company UTS introduces new watches 1000M GMT, the new version of the line 1000M GMT. Feature of the new items – a vivid blue dial and a limited edition. 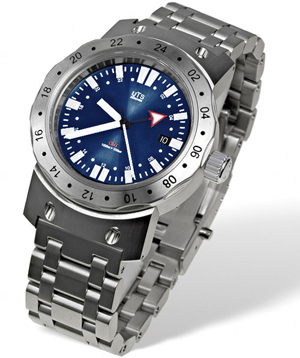 The body model with a diameter of 43 mm and a thickness of 14.5 mm made of stainless steel. It should also be noted bezel model, made in the form of the scale = 24-hour format. Clock face is made, as already noted, in a bright shade of blue juicy, which clearly show through the white hour indexes, sufficiently large size. The arrows in the tone of temporary indexes are made in white. The aperture of the date located on the position of “3” hours. The back cover – Sapphire. The basis of hours – Swiss movement ETA 2893-2 Top Grade. Caliber is decorated with a pattern in the form of so-called Geneva waves and pearly granulation. The rotor mechanism is engraved UTS. Hours UTS 1000M GMT represented by a limited edition of 200 copies. Watches are equipped with a bracelet and a rubber strap to choose from.